9th September 1754, St Tudy, Cornwall, England. William Bligh came from a local Devon family. Local Schools. Went to sea at the age of fifteen. 1754: Bligh was baptised at St Andrew’s Church, Plymouth, the church where his parents had got married a year previously. 1770: He joined Royal Navy on 27th July. 1776-79: His first major appointment was on James Cook’s third and last voyage when he served as Master of HMS Resolution. 1781: William Bligh promoted to Lieutenant on 5th August after action at Dogger Bank. 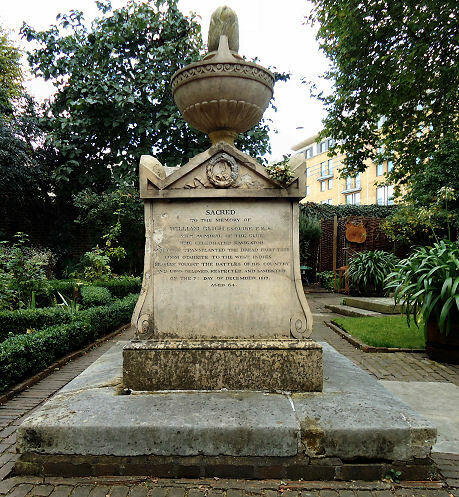 1782: He took part in the relief of Gibraltar on 13th October. 1783-87: Entered the Merchant service after the declaration of peace. 1787: Commanded the Britannia where Midshipman Fletcher Christian sailed with him. On 16th August he was appointed to command H.M.S. Bounty on an expedition organised by Sir Joseph Banks and the Admiralty. He was to sail to Tahiti to collect breadfruit plants for transplantation in the West Indies to feed the slave population. Left Spithead on 23rd December but failed to round Cape Horn due to storms and went instead via the Cape of Good Hope. 1788: William Bligh arrived in Tahiti on 26th October. 1789: Left Tahiti on 4th April. On 28th April a mutiny led by Fletcher Christian was staged. Bligh and 18 loyal members of the crew were cast adrift in the Bounty’s launch. Reached the Dutch Island of Timor on 12th June after 41 hazardous days at sea, a journey of 6,705 kilometers. Once there he bought a Dutch Schooner and sailed for Batavia (Jakarta) and then home to England. 1790: Bligh reached Portsmouth on 13th March with only 11 crew members surviving. 1791: On 3rd August he embarked on a second breadfruit voyage in H.M.S. Providence taking another ship with him. 1793: Returned to England on 7th August after a successful voyage. 1797: Commanded a ship at the Battle of Camperdown. 1801: Elected a Fellow of the Royal Society. Commanded a ship at the Battle of Copenhagen with Lord Nelson. 1806: Offered post as Captain General and Governor of New South Wales, Australia and set sail in February. His wife was too ill to travel but his daughter Mary and her husband Lieutenant John Putland (who became his aide-de-camp) accompanied him. Bligh arrived at Port Jackson on 6th August. 1808: Bligh’s reforms in New South Wales brought him into conflict with the leading men of the colony, notably John MacArthur. On 26th January MacArthur sent Major George Johnston to arrest Bligh and assumed control of the colony. 1811: Johnston was subsequently arrested and tried for this offence. Bligh was promoted to Rear Admiral. 1812: On 15th April his wife died. Bligh and unmarried daughters moved from London to a Manor House in Farningham, near Maidstone, Kent. 1814: Promoted to Vice Admiral but did not again take command of a ship. 4th February 1781 to Elizabeth Betham at Orchan Paris Church, near Douglas, Isle of Man. 7th December 1817, on visit to London, England. St. Mary’s Church, Lambeth, London, England next to his wife. This is now the site of the National Garden Museum. Garden Museum, Lambeth. See article on Topiary in the United Kingdom. Mansion where Bligh retired to still stands, Farningham, near Maidstone.